“Rock-N-Roll Never Dies” is a documentary chronicling the career of the Rock-N-Roll Express by filmmaker Michael Eliot, who made the fantastic JCP documentary, “JCP: The Good Old Days,” that was released last year. As was the case with the JCP documentary, Eliot has made the most with a limited amount of resources and produced another compelling film that stacks up in terms of production value with WWE’s best work. The Rock-N-Roll Express is one of the most popular and influential tag teams in the history of wrestling. Their look and in-ring style has influenced everyone from The Rockers to The Hardy Boys to The Young Bucks and several other teams as well. The highlight of the documentary is hearing about how Robert Gibson & Ricky Morton were programmed to have feuds that set the crowd on fire. They started in the Memphis territory, but they were under the Fabulous Ones. Morton and Gibson acknowledge that they knew they were never going to be the top team in the Memphis territory as long as The Fabulous Ones were around. Watt’s territory had been down in ‘83, but when he made a talent trade with the Jerry Jarrett, who ran the Memphis territory, business picked up greatly by ’84. The Rock-N-Roll Express brought a radically different style to Watt’s territory than fans were used to, as Watts had employed bigger and more physical wrestlers, but the key was that when the Rock-N-Roll Express came to the territory, Watts told the bigger wrestlers they had to sell for them. When the Rock-N-Roll Express went to the Mid-South territory under Bill Watts, they also were accompanied by The Midnight Express and Jim Cornette. The appeal of the Rock-N-Roll Express was created with their Rock-N-Roll gimmick. They wore Rock-N-Roll t-shirts and tied bandanas on their gear. Their look appealed to teenage girls and young women at the time and they quickly became very popular. Watts presented the Rock-N-Roll Express different than any other act. He built them up with entrance music, which was rare in those days, along with radio appearances on the local rock-n-roll stations. Eliot frames the narrative of the documentary so that the way the Rock-N-Roll Express and Midnight Express were built up and groomed for each other is transparent and it really is an example of how promoters back in the territory logically set up and groomed talent to work with each other to book money. Morton & Gibson went to Watt’s territory first before Eaton, Condry, and Cornette arrived. They were built up in a program with Magnum TA & Mr. Wrestling 2. They were supposed to go back to the Memphis territory, but they ended up staying with Watts. Watts ended up keeping the two teams about, but Cornette discusses how they knew the fans were dying to see the two teams feud because they had teased the feud on TV. Once the feud began, the heat was amazing. Condry says, “We couldn’t get to the ring to start the match,” which was because the fans hated the Midnight Express. Eaton appears and discusses how people still believed wrestling was real. Cornette is fantastic as a talking head throughout the documentary talking about the heat the feud between the Rock-N-Rock Express and The Midnight Express drew from fans and the amount of business they did during that time. JCP was heating up at the time and Crockett had taken JCP to national TV on TBS. It’s exaggerated in the narrative that the territory was down before the Rock-N-Roll Express was hired by Jim Crockett Jr. Another great lesson in how to build up a debuting team is demonstrated in how the Rock-N-Roll Express was promoted before debuting in JCP. They aired music videos on TV for three weeks before Morton & Gibson made their debut. Ivan Koloff & Krusher Khruschev was the tag team champions at the time and they had blown through everyone in their path, but they lost to Gibson & Morton in a one hour match on TV. This instantly made them stars and booker Dusty Rhodes knew that the real money matches with the Midnight Express down the line. It is fascinating to see how Gibson & Morton got over and lived their gimmick as rock stars to the limit. Magnum T.A. appears and talked about how TV was a star maker. This was a whole new level of exposure for the Morton & Gibson because their feud with the Midnight Express was now airing on national television. 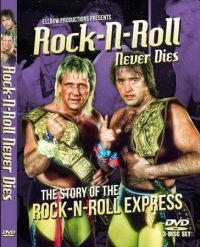 JCP heated up big time between 1984-1986 and the Rock-N-Roll Express-Midnight Express was a huge draw for the promotion, but the documentary does a good job of illustrating that Morton & Gibson’s fame didn’t please Rhodes. There would be A Team and a B Team out touring. The Rock-N-Roll Express-Midnight Express feud would headline the B Team tour with no stars underneath them and they would sell out venues in the Carolinas while the A team was selling out in Baltimore with all of the top stars. Some fans would leave shows after the Rock-N-Roll-Midnight Express match took place. George South appears and says that Flair vs. Dusty was old hat to people at the time. Referee Tommy Young appears and says that The Rock-N-Roll Express-Midnight Express feud was every bit as good as Flair-Steamboat. Morton talked about how Rhodes tried to separate them and said he was trying to kill them off. At one point Morton claims that Dusty put him in a singles program against Flair for the World Title and claims he Rhodes would have made him champion in exchange for firing Gibson, but that story isn’t true. Eventually the Rock-N-Roll Express cooled off, but Morton claims that Crockett screwed them financially. JCP had started a Rock-N-Roll Express fan club and Morton claims they had over 1 million people sign up, but there’s no way that figure is true. Morton claims that they didn’t see any money from it and they resented working so hard only to get screwed. Eventually Morton & Gibson were released by JCP when Rhodes told them that they weren’t playing ball right with him. The documentary closes with a look at the tail end of Morton & Gibson’s big run in wrestling. They went to AWA and Memphis before eventually going to WCW, but weren’t pushed as a top act like they had been before. They eventually ended up in SMW, which was promoted and booked by Jim Cornette for one last money drawing run with The Heavenly Bodies of Tom Pritchard & Stan Lane. Cornette followed the same formula that had worked so well for Watts and Rhodes. He built up The Rock-N-Roll Express and The Heavenly Bodies to get both teams hot before they feuded. They didn’t draw the type of money that the Rock-N-Roll Express-Midnight Express feud had drawn in Charlotte, but they did well for SMW according to Cornette, who said, “"We didn't draw what we did in Charlotte, but it was the saving grace of the territory." Jimmy Del Ray eventually replaced Stan Lane in the Heavenly Bodies. The footage to the blow off between the Heavenly Bodies and The Rock-N-Roll Express is amazing to watch because of the reaction of the crowd to the finish. Cornette had built the feud to make the fans feel as if the Rock-N-Roll Express were headed to WWE to build some steam behind the Loser Leaves Town stipulation. When they end up winning the match, the reaction of the fans is amazing to watch unfold. This documentary is a must-watch for fans of wrestling. Elliot did an excellent job of pulling together a great film with limited resources that told the story of the Rock-N-Roll express and the various talking heads that appear throughout the film explain how and why they were able to draw. The simple formula of building up the Rock-N-Roll Express in various territories before feuding them with their adversaries the Midnight Express in different territories worked really well and the way the Rock-N-Roll Express were marketed to go along with their appearance and the way they wrestled in the ring made them the ultimate babyfaces in the eyes of young fans, especially young women. Cornette was really good throughout the documentary talking about the Rock-N-Roll Express-Midnight Express feud and why it worked for both sides. The stories that Cornette, Morton, Gibson, and Condry told about the reaction to their feud were fantastic. Of course, there’s a lot of exaggeration here, especially when it comes to Morton’s comments about The Rock-N-Roll Express Fan Club that JCP was operating. Although Morton does tell an incredible story about going to a secret club called the Black Banana with Buddy Landell that might be one of the greatest pro wrestling party stories ever told. This release is well-worth picking up and Michael Elliot deserved praise for the masterful job he did putting together this documentary with limited resources. This documentary is up to if not exceeding the quality of WWE documentaries from a production standpoint. “Rock-N-Roll Never Dies” by clicking HERE or by visiting elbowproductions.weebly.com. Please visit Facebook.com/SeanRadicanRWC on Facebook and click “like” to join the Radican’s Wrestling Community Facebook fan page.